Let me elaborate on each of those a little more. For me to be truly drawn in to a film of this genre I need to know that it’s not just come out of the head, off the pen and onto the paper of an expert fiction writer. Now don’t get me wrong – I’m well aware for the need to make good use of brilliant screenwriters. And I also applaud the use of ‘artistic licence’ (though not to the point where history is being totally re-written) – hence the clause “based upon” is generally good enough for me. I simply mean that for the most part these type of films benefit from being rooted in something historical. Who doesn’t love a bit of a conspiracy? I remember being rather unnerved to say the least when I watched JFK and can almost entirely blame Stone for my admiration of this genre. I was always partial to a bit of the X-files too. I’m going to stick my neck out here and say “thank god for George Clooney.” Love him or loathe him as an actor (and I’m more pro his acting work than not) what he’s done for ‘Hollywood’ films in terms challenging ‘the system’ at the same time as bringing in the numbers to the box-office has to be respected. Oddly enough, and I only just realised this as I was preparing this post, he’s produced the last two films that I’ve watched: The Informant and Argo (the subject of this post). If a film has done a good job on me then I will most often want to go away and either Google it, wiki it or amazon it to find out more: the truth, the historical context or what happened to those involved afterwards. These type of films should have an effect on you, they shouldn’t remain a passive experience and were never intended by the director to be viewed in a vacuum. Argo (out in cinemas now) ticks all of those boxes for me. Ben Affleck – who I must admit since Good Will Hunting has never drawn me to part with the cost of cinema ticket – turns director/producer/actor in this political thriller. And a bloomin good job he does too. I knew very little about the Iranian US embassy hostage crisis and I had no idea at all about the particular element of that crisis that this film focuses in on – the escape and hideout of six of the US embassy staff and, more central to the film, the CIA/government backed plans for their rescue. Affleck plays the role of seasoned CIA man who comes up with a somewhat left-of-centre plan to rescue the six – using the cover story of being part of the film crew for a fictitious science fiction movie called Argo. I almost want to say: “and hilarity ensues”. But it doesn’t of course, despite the preposterous plan . What does follow is, a well thought out, albeit dramatised, depiction of the events that followed the hatching of that plan. I’m not going to spoil the outcome – though if you know the history here there is no real surprise. Strong performances from Affleck and the supporting cast drew me in so well that I found myself gripped by the ‘will they/won’t they get caught’ mindset. The film also benefits from great production design that drops you back into the late ’70s and good use of location (Turkey) to provide the atmosphere of revolutionary Tehran. I liked it – a lot. Directors and studios: do more of this stuff please. This entry was posted in Film and tagged argo, film, george clooney, hollywood, JFK, Oliver Stone, politics, the informant. Bookmark the permalink. Ah, is definitely on my to-see list, especially after hearing Affleck interviewed on the Mayo/Kermode podcast (or “radio show”, Granddad). For superb Clooney politicallyness, have you seen Good Night and Good Luck? Is awesome. I have, and it too was good. 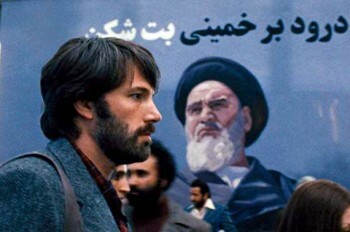 Argo is a little more gripping but the “politicallyness” of both floats my boat.